Lets face it, it is too HOT to grill! I know Summer is synonymous with grilling but when it is 108 degrees outside no one wants to put anyone they love in charge of grilling, that’s just cruel! These oven baked ribs are the next best thing! Bake them for 3 hours and there are no worries of them catching fire or if the smoke is hot enough. 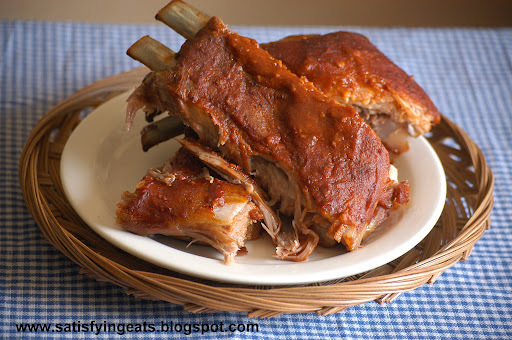 If you haven’t tried my Sweet & Tangy BBQ Sauce, it is a must for these tender and succulent ribs! 1. Generously season both sides of ribs. 2. Preheat oven to 300 degrees. 3. Place ribs on a sheet pan and completely cover with foil. 4. Cook for 3 hours and the last 15 minutes remove foil and pour BBQ sauce over ribs. 5. Return to oven for final 15 minutes. Sooooooooooo good!!!!!!! I absolutly LOVE this BBQ sauce !!!! The ribs fell off the bone! Hubby loved!!!! !